The Comanche–Mexico Wars refers to conflicts from 1821 to 1870 which consisted of large-scale raids into northern Mexico by Comanches and their Kiowa allies which left thousands of people dead. The Comanche raids were sparked by the declining military and military capability of Mexico in the turbulent years after it gained independence in 1821, plus the growing market in the United States for stolen Mexican horses and cattle. By the time the American army invaded northern Mexico in 1846 during the Mexican-American War the region was devastated. Comanche raids into Mexico continued until 1870. The Comanche were finally defeated by the U.S. in 1875 and forced onto a reservation. In the words of American General James Wilkinson the Comanche were "the most powerful nation of savages on this continent." That power would be amply demonstrated as the United States and the newly independent country of Mexico contested ownership of Texas and much of the American Southwest. The Comanche considered themselves owners of a 500-by-400-mile (800 by 640 km) block of land that stretched from the Arkansas River in Colorado to near the Rio Grande in Texas. In the early nineteenth century, more than 10,000 Comanches shared this land, called Comancheria, with 2,000 Kiowa and Plains Apache (Kiowa-Apache). They sometimes granted hunting rights to other tribes, such as the Wichita. The Comanche came to the attention of the Spanish in New Mexico in 1706 and were a severe threat until peace treaties were concluded with their eastern bands by Pedro Vial in 1785 and their western bands in 1786. The Spanish welcomed the Comanche as an ally against the Apache, forgave their transgressions, traded manufactured items and corn to them for horses, captives, and buffalo meat, and showered them with gifts. The mutually beneficial relationship between Spaniard and Comanche began to come apart in 1821 when Mexico won its independence from Spain. The new country had no resources to continue paying tribute to the Comanche and was embroiled in domestic disputes rather than paying attention to troubles on its northern frontier. The Comanche, on their part, in the 1820s and 1830s were under intense pressure from competitors. The Osage were formidable enemies. The expulsion by the U.S. and the migration west to Oklahoma by the Five civilized tribes, the Shawnee, and the Delaware brought them into competition with the Comanche on the Great Plains. The Comanche lost several battles with the Osage and the Eastern Indian tribes who were generally better armed. Anglo-Americans arrived on the heels of the eastern Indians. Traders journeyed in large numbers along the Santa Fe Trail across the northern border of Comancheria and White hunters and depleted the buffalo herds in that vicinity. Northern Plains Indians such as the Cheyenne and Arapaho pressed south, drawn by the enormous herds of horses on the southern Great Plains, and also defeated the Comanche in battles. Moreover, Comanche numbers were declining, diminished by epidemics of European diseases. Comanche interests dictated peace with the Mexicans so threats from other Indians and Anglo-Americans could be addressed. On several occasions in the 1820s the Comanche attempted to obtain Mexican military assistance to repel the Indian invaders of their land, but their requests were denied. As they had often aided the Mexicans in the past to fight their mutual enemies, the Apache, this denial undermined the Comanche’s commitment to peace with Mexico. However, as an inducement to peaceful relations, Mexican provincial governments made haste to strengthen trade ties with the Comanche in the early 1830s. An important factor encouraging Comanche raids of Mexican ranches was the insatiable demand for horses and mules by the Anglo-Americans now flooding into lands west of the Mississippi River. The Comanches could meet that demand by breeding and selling horses from their herds, capturing and training wild horses from the numerous herds in Comancheria, or raiding Mexican ranches and stealing horses. The last was often the preferred option of ambitious young men striving to become rich in a well-to-do pastoral society. Comanche raids for horses in Texas and along the Rio Grande in Mexico increased in 1831 and afterwards. A young, poor, or low ranking Comanche man could better his circumstances — albeit at great risk to his life — by raiding for horses and captives. The wealth he obtained would enable him to buy a Comanche wife — or he might find a first, second, or third wife among the captives. The Mexican government accused the U.S. and independent Texas of encouraging Comanche raids especially by trading guns to the Comanche in exchange for horses. In 1826, a Mexican official appealed to the US to stop the ‘traders in blood who put instruments of death in the hands of those barbarians.” In 1835, the state of Chihuahua, ravaged by Apache as well as Comanche raids, offered a bounty of 100 pesos (about $100) for each scalp of a hostile Indian man and lesser amounts for women and children. American and Indian, primarily Delaware and Shawnee, scalp hunters killed many Apache and peaceful Indians for the bounty over the next few years, but apparently did not succeed in killing very many Comanches. The Comanche resolved most of the challenges facing them in the 1830s with adroit diplomacy. Their strategy was flexible. With New Mexico, a Mexican province to their west, they enjoyed friendly trading relations. New Mexico was more of an asset than a threat to the Comanches and the New Mexicans avoided war with the Indians. In 1841 Governor Armijo was ordered by the Mexican central government to join a military campaign against the Comanche. Armijo declined: “to declare war on the Comanches would bring complete ruin to the Department of New Mexico.” In 1844, New Mexican officials learned of but did nothing to prevent a Comanche raid on the Department of Chihuahua. With their western flank secured by an unthreatening New Mexico, the Comanche dealt with rivals on their northern and eastern borders. In 1835, they met with a delegation of U.S. soldiers and eastern Indians in the Wichita Mountains of Oklahoma and concluded a peace agreement. The agreement permitted eastern Indians and Americans to hunt on Comanche lands—and did not restrain the Comanche and their Kiowa and Wichita allies from making war on Mexico. With their eastern flank secured by the treaty with the U.S., the Comanches next concluded a peace agreement in 1840 with the Southern Cheyenne and Arapaho pressing on them from the north. It was highly favorable to the Cheyenne and Arapaho. 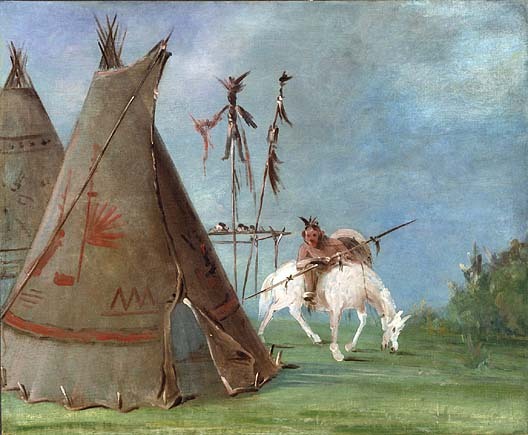 They were permitted to reside and hunt on the buffalo and horse-rich Comanche lands and, in addition, the affluent Comanches gave them gifts, including as many as six horses to every Cheyenne and Arapaho man. The Comanche welcome to these two tribes, their southern bands numbering perhaps 4,000, was both an acknowledgment that they were formidable rivals and also that the Comanche were short on men and resources to maintain their control over Comancheria. South and southeast of Comancheria were the fast-growing Anglo communities of Texas. In the 1820s and 1830s most Comanche raids were in the southern parts of Texas and affected the largely Hispanic population around San Antonio, Laredo and Goliad. After Texas broke free of Mexico in 1836, The Comanche had to deal with the new Republic of Texas. Texas’s first President, Sam Houston, was knowledgeable about Indians and favored a policy of accommodation with the Comanche. However, continued Comanche raids led to the election in 1838 of Mirabeau B. Lamar who favored a more aggressive approach. The massacre of 35 Comanche chiefs attending a peace conference in San Antonio in March 1840 set off a series of bloody reprisals and battles. Hundreds of Comanches descended upon and destroyed the towns of Victoria and Linnville in 1840 (see Great Raid of 1840). Although the Texans demonstrated they could punish the Comanche (See Battle of Plum Creek) military campaigns emptied their treasury and Texas became more accommodating. (See Texas-Indian Wars) In 1844, the Texans and the Comanches came to an agreement which recognized Comanche lands and left Comancheria intact. What the agreements with the United States and neighboring tribes and a hiatus in the struggle with Texas accomplished was to free up the Comanche to make unrestrained war on the Mexican provinces south of the Rio Grande. As the 1830s demonstrated, the Texans, the United States, and neighboring tribes all had the ability to invade Comancheria and attack the Comanche homeland. Mexico, by contrast, was rich in horses and unable to counterattack due to distance and the fact that, after 1836, any Mexican military expedition against Comanches would have had to pass through Texas, an independent country unfriendly to Mexico. In attacking Mexico, the Comanche seemed motivated by opportunity, economics and revenge – their animosity toward non-Comanches sharpened by decades of war and reprisals. Thus, their raids on Mexico became increasingly bloody and destructive. Comanche raids into Mexico before 1840 had generally penetrated only a short distance south of the Rio Grande and had usually resulted in only a few deaths and the theft of a few thousand livestock. The threat, however, from the Comanche was serious enough in 1826 in northern Nuevo Leon, that the Governor issued orders that no one should venture out of villages into the countryside except in groups of at least thirty armed men. In the 1840s, Comanche raids became larger, more deadly, and penetrated deeply into Mexico. In September 1840 and continuing until March 1841 came the first of the great raids. During this period six Comanche armies numbering between two hundred and eight hundred warriors invaded northern Mexico. The most far reaching of the raids reached the region of San Luis Potosi and Zacatecas 400 miles south of the Big Bend, their most common crossing point into Mexico. 472 Mexicans were reported killed and more than 100 captives were taken from these raids. Many others were left homeless, their livelihoods destroyed, their livestock stolen or killed. So much wealth did the Comanches obtain that the number of raids dropped off slightly for the next three years, but resumed even more intensely between 1844 and 1848 — after peace had been made with Texas. The Comanche could conduct their raids in Mexico with no risk of retaliation by Mexico in their home territory north of the Rio Grande in Texas. Moreover, the Federal government of Mexico, embroiled in political disputes, gave little assistance to the states and their citizens to fend off the Comanche. Poorly-armed militia, organized by state and local governments and large ranchers, and hired scalp-hunters—often Anglo-Americans or other Indians—opposed the Comanche raids. Durango in 1847 adopted a bounty system, paying 50 pesos for the head of a hostile Indian. In 1849, the bounty was raised to 200 pesos per head, more than a laborer could make in wages in a full year. The Comanche have often been portrayed by American historians as a simple and crude tribe lacking any coherent political organization or authority. Their success in creating a virtual empire of the Plains, sophisticated diplomacy, and highly organized raids on Mexico contradicts that opinion. The numerous small Comanche bands came together in summer, usually on the Red River or one of its tributaries in Texas or Oklahoma to formulate plans and organize groups of raiders. Comanches came all the way from the Arkansas River to join the raids. Among the raiders were Kiowa, Kiowa-Apache, and other Indians plus a few renegade Mexicans and Anglos. In fall, small groups of Comanche rendezvoused at Big Spring and headed south along well-known trails, riding at night during the full moon. (A full moon in the fall was called a “Comanche Moon” by Texans). They crossed the Rio Grande either east or west of the Big Bend and met up and united in the Bolson de Mapimi, a large empty desert and range region. The Bolson offered good grazing, abundant springs, and mild winter temperatures. 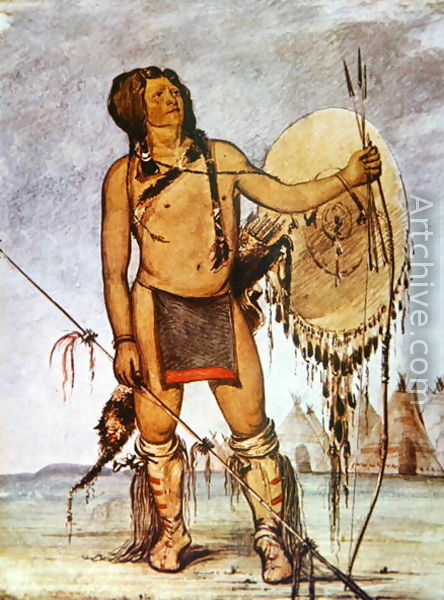 Many Comanche men brought their families south with them and resided for a winter there in the safety of its vastness. From the Bolson, the Comanche branched out in all directions in small and large groups to raid into tropical Mexico as far south as Jalisco and Querétaro. Each warrior took three or four horses with him, saving his favorite for battle. Women and children commonly traveled with the men and were prepared to defend themselves if necessary. A weakness of the Comanche was their determination to recover the bodies of their fallen warriors. They took extreme risks and suffered additional casualties as a result. Moreover, they often seemed careless and were caught unawares by large contingents of Mexican soldiers. At the end of their yearly raids, usually in the late winter or spring, the Comanche drove their captured livestock back to Texas. They sold or traded the horses and mules at several American trading posts as far north as Bent’s Fort in Colorado. They needed the captives, mostly children, as laborers. The boys were put to work taking care of their horse herds. The girls assisted in household chores, including preparing buffalo skins for sale as robes. The boys often grew up to be Comanche warriors and the girls often became one of several wives of Comanche men. A few of the captives were ransomed. The Legislature of Chihuahua described the situation it faced in 1846. “We travel the roads…at their [i.e. the Comanches and Apaches] whim; we cultivate the land where they wish and in the amount they wish; we use sparingly things they have left to us until the moment that it strikes their appetite to take them for themselves.” The Comanche raids deep into Mexico created fear that the Comanche soon might even be seen "on the streets of Mexico City." Traveler Josiah Gregg said that “the whole country from New Mexico to the borders of Durango is almost entirely depopulated. The haciendas and ranchos have been mostly abandoned, and the people chiefly confined to the towns and cities.” When American troops invaded northern Mexico in 1846 they found a devastated landscape and a demoralized people. There was little resistance to the Americans. Some Mexicans in the north perhaps welcomed the US invasion with the hope that the U.S. would be more successful in fighting the “barbarians” than Mexican forces had been. They would be disappointed. Comanche raids into Mexico did not cease with the end of Mexican-American War in 1848, but the Comanche faced a new situation as Texas joined the United States and the US took over the future states of California, Arizona, and New Mexico. Mexico derived only a single benefit from the Treaty of Guadalupe Hidalgo which ended the war. The United States pledged in the treaty that it would police the border to prevent Indian invasions of Mexico. The US had little more success in curtailing Comanche and Apache raids than Mexico. If anything the tempo of the raids increased in the 1850s. In 1852, in perhaps the most far-ranging of all Comanche raids, they reached the Mexican state of Jalisco in the tropics near the Pacific Ocean, 600 miles from their usual crossing point of the Rio Grande, near Presidio, Texas and nearly 1,000 miles from their Great Plains homeland. By 1856, authorities in horse-rich Durango would claim that Indian raids, mostly Comanche, in their state had taken nearly 6,000 lives, abducted 748 people, and forced the abandonment of 358 settlements over the previous 20 years. The Comanche reached the peak of their power in the late 1840s and declined quickly. In 1849 a cholera epidemic among the Plains Indians killed thousands of Comanches and their allies. The 1850s saw a drought that severely impacted the buffalo herds – already under pressure from market hunting – in Comancheria. The Comanche’s huge horse herds put further pressure on the environment of their homeland. Soon, the Comanche were eating their horses. The fast-growing population of Texas – 600,000 by 1860 – encroached on Comanche lands. The U.S. army established five frontier garrisons within the borders of Comancheria, inhibiting their mobility and reducing their range. By the end of the 1850s the Comanche population had been reduced by about one-half what it had been before 1849. During the American Civil War the Comanche would push back the Texas frontier and reclaim some of their territory, but they would soon be overwhelmed and the last of them, now reduced to about 1,500 people, would surrender to the U.S. army in 1875. Their long-term raiding partners, the Kiowa and Kiowa-Apache, also surrendered. The last Comanche raid into Mexico may have been in 1870 when the Comanche reportedly killed 30 persons near Lampazos, Nuevo Leon.